Ester Ledecka: 'This Must Be Some Mistake,' Says Snowboarder After Winning Olympic Gold In Skiing : The Torch She went up the hill a snowboarder but came down an Olympic champion skier. That's one way to tell the story of Ester Ledecka, the Czech athlete who stunned the world in South Korea. The Czech Republic's Ester Ledecka won the women's Super-G race at the Jeongseon Alpine Center by just 0.01, pulling off an upset at the Pyeongchang 2018 Winter Olympics in South Korea. She went up the hill a snowboarder but came down an Olympic champion skier. That's one way to tell the story of Ester Ledecka, the Czech athlete who stunned the world — and herself — by winning the women's Super-G race at the Pyeongchang Winter Olympics. "How did that happen?" she asked a cameraman at the bottom of her run. Before today, Ledecka had been most well-known as a snowboarder — that's where she's had the most success, including world titles and a trip to the Sochi Games in 2014. But she has refused to specialize in one sport, and she started racing on the World Cup Alpine circuit two years ago. As for how she won, an elated Ledecka said, in a transcription from the Olympics' news service, "I really don't know what happened. You tell me ... I was riding. I really don't know what happened. It was great." When asked for her reaction after seeing her name flash on top of the leaderboard, Ledecka said she thought, "This must be some mistake, that they're going to switch the time for some others." Ledecka, 22, beat Austria's Anna Veith — the defending champion in this event — by a sliver: 0.01 seconds, in a time of 1:21.11. Liechtenstein's Tina Weirather finished third. In the women's Super-G race, skiers take just one run down the hill. For a sense of the magnitude of this upset, consider that ahead of the Olympics, Ledecka had been ranked 43rd in the Super-G and 68th overall in the World Cup Alpine skiing rankings. Weirather was sixth overall; Veith was 17th. Before today, Ledecka had never stood on a podium for international-level Alpine skiing; in snowboarding, she's won multiple championships. The Czech Olympic team is calling it the "Miracle on Snow," echoing the Miracle on Ice of 1980, when the U.S. ice hockey team beat Russia. At a news conference that followed her upset win, Ledecka wore her ski goggles — "Because I wasn't prepared to be at the ceremony and I don't have makeup on," she said. The field for the women's Super-G also included American Lindsey Vonn (No. 10 in the world overall), who sped out of the gate and topped 100 kph in the first portion of the course — but lost her way in the middle and lower portion, losing time as she redirected herself. Vonn was the first racer on the hill Saturday; she wound up finishing in a tie for sixth. Even before her gold medal shocker, Ledecka had already made Olympic history: She's the first person to enter both Alpine skiing and snowboarding events. But she proved here on Saturday (Friday night in the U.S.) that she's not just a novelty in the record books. "All the other girls didn't risk a lot," Ledecka said afterwards. "There must be a lot of pressure on them. I was just trying to do my best run." 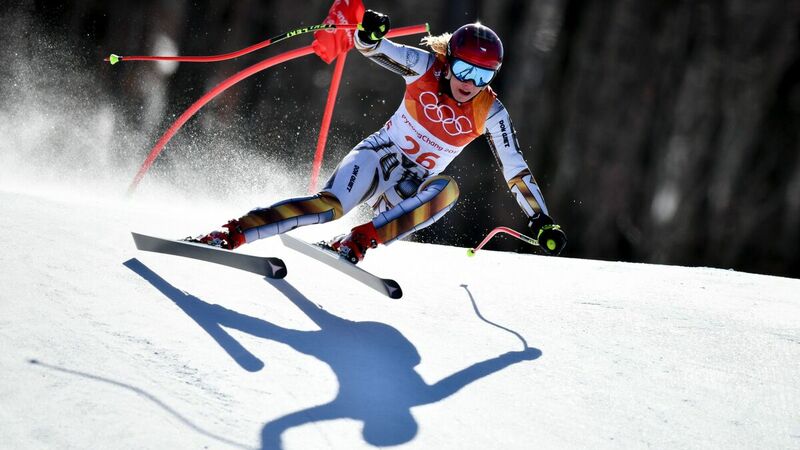 As Ledecka thundered down the mountain at Jeongseon Alpine Center, she recorded her fastest intervals at the bottom of the course, making her result even more astounding to those watching. Ledecka has several events remaining on her Olympics schedule in South Korea, from the women's parallel giant slalom in snowboarding to the downhill and Alpine combined in skiing. When she was asked about the people who have told her to specialize in either skiing or snowboarding, Ledecka replied that if she were pressured to choose one sport, she would choose another coach, instead.